Is it a growing characteristic of 21st Century Global Capitalism. The recurring Greek debt crises represent a new emerging form of Financial Imperialism. What, then, is imperialism, and especially what, when described is financial imperialism? How does what has been emerging in Greece under the Eurozone constitute a new form of Imperialism? 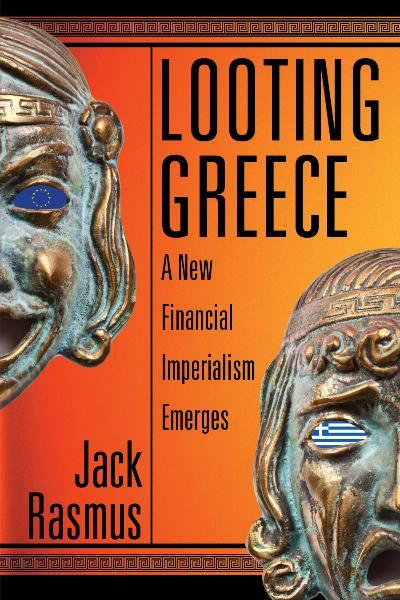 How is the new Financial Imperialism emerging in Greece both similar and different from other forms of Imperialism? And how does this represent a broader development, beyond Greece, of a new 21st century form of Imperialism in development? Imperialism is a term that carries both political-military as well as economic meaning. It generally refers to one State, or pre-State set of political institutions and society, conquering and subjugating another. The conquest/subjugation may occur for largely geopolitical reasons—to obtain territories that are strategically located and/or to deny one’s competitors from acquiring the same. It may result as the consequence of the nationalist fervor or domestic instability in one State then being diverted by its elites who are under domestic threat, toward the conquest of an external State as a means to avoid challenges to their rule at home. Conquest and acquisition may be undertaken as well as a means to enable population overflow, from the old to the new territory. These political reasons for Imperialism have been driving it from time immemorial. Rome attacked Carthage in the third century BCE in part to drive it from its threatening strategic positions in Sicily and Sardinia, and also to prevent it from expanding northward in the Iberian Peninsula. Domestic nationalist fervor explains much of why in post-1789 revolutionary France the French bourgeois elites turned to Napoleon who then diverted domestic discontent and redirected it toward military conquest. Imperialism as an outlet for German eastward population settlement has been argued as the rationale behind Hitler’s ‘Lebensraum’ doctrine. And US ‘Manifest Destiny’ doctrine, to populate the western continent of North America, was used in the 19th century as a justification, in part, for US imperialist wars with Mexico and native American populations at the time. But what may appear as purely political or social motives behind Imperialist expansion—even in pre-Capitalist or early Capitalist periods—has almost always had a more fundamental economic origin. It could be argued, for example, that Rome provoked and attacked Carthage to drive it from its colonies on the western coast of Sicily and thus deny it access to grain production there; to deny it strategic ports on the eastern Iberian coast from which to trade; and eventually to acquire the lucrative silver mines in the southernmost region of the peninsula at the time. Nazi Germany’s Lebensraum doctrine, it may be argued, was but a cover for acquiring agricultural lands of southern Russia and Ukraine and as a stepping stone to the oil fields of Azerbaijan, Persia and Iraq. And US western expansion was less to achieve a population outlet than to remove foreign (Mexico, Britain) and native American impediments to securing natural resources exclusively for US use. US acquisitions still further ‘west’—i.e. of Hawaii, the Philippines and other pacific islands were even less about population overflow and more about ensuring access to western pacific trade and markets in the face of European imperialists scrambling to wrap up the remaining Asian markets and resources. Imperialism is often associated with military action, as one State subdues and then rules the other and its peoples. But imperialist expansion is not always associated with military conquest. The dominating State may so threaten a competitor state with war or de facto acquisition that the latter simply cedes control by treaty over the new territory it itself had conquered by force—as did Spain in the case of Florida or Britain with the US Pacific Northwest territories. Or the new territory may be inherited from the rulers of that territory. Historically, much of the Roman Empire’s territory in the eastern Mediterranean was acquired this way. Or the new territory may be purchased, one state from the other—as with France and the Louisiana Purchase, Spanish Florida accession, and Russia’s sale of Alaska to the US. In other words, imperialism does not always require open warfare as the means to acquisition but it is virtually always associated with economic objectives, even when it appears to be geo-political maneuvering or due to social (i.e. nationalist ideology, domestic crises, population diversion, etc.) causes. Whether via a bona-fide colony, near-colony, economic protectorate, or dependency the basic economic purpose of imperialism is to extract wealth from the dominated state and society, to enrich the Imperialist state and its economic elites. But some forms of Imperialism and colonial arrangements are more ‘profitable’ than others. Imperialism extracts wealth via many forms—natural resources ‘harvesting’ and relocation back to the Imperial economy, favorable and exploitive terms of trade for exports/imports to and from the dominated state, low cost-low wage production of commodities and semi-finished goods, exclusive control of markets in the dominion country, and other ways of obtaining goods at lower than market price for resale at a higher market price. This is where the imperial economy simply takes the natural resources from the land and sends them back to its economy. The resource can be minerals, precious metals, scarce or highly demanded agricultural products, or even human beings—such as occurred with the slave trade. Instead of relocating the resources and production in the home market at a higher cost, the production of the goods is arranged in the colony, and then shipped back to the host imperial country for resale domestically or abroad. The semi-finished or finished goods are more profitable due to the lower cost of production throughout the supply chain. The imperialist elites claim ownership of the land, then rent it out to the local population that once owned it to produce on it. In exchange, the imperialist elites extract a ‘rent’ for the use of the land. Here the imperialist elites of the home country, in the form of merchants, ship owners, and bankers, arrange to trade and transport goods both to and from the dominated economy on terms favorable to their costs. By controlling the source of money, either as currency, credit, or precious metals, they are able to dictate the arrangements and terms of trade finance. More typical in former times, this is simple theft of a share of production and trade by the administration of the imperialist elite. The classic case, once again, was Imperial Rome and its economic relations with its provinces. It left the production and initial extraction of wealth up to the local population, while its imperial bureaucracy, imposed locally, was simply concerned with ensuring it received a majority percentage of goods produced or traded—either in money form or ‘in kind’ that it then shipped back to its home economy Italy for resale. A vestige of this in modern colonial times was the imposition of taxation on the local populace, to pay for the costs of the Imperial bureaucracy and especially the cost of the imperial military apparatus stationed in the dominated state to protect the bureaucracy and the wealth extraction. The preceding five basic forms of exploitation and wealth extraction have been the subject of critical analyses of imperialism and colonialism for more than a century. What all the above share is a focus on the production and trade of real goods and on land as the source of the wealth transfer. However, the five classical types of exploitation and extraction disregard independent financial forms of wealth extraction. Both capitalist critics and anti-capitalist critics of imperialism, including Marxists, have based their analysis of imperialism on the production of real goods. This theoretical bias has resulted in a disregard of the forms of financial exploitation and imperialism, which have been growing as finance capital itself has been assuming a growing role relative to 21st century global capitalism. Classical 19th century British Imperialism extracted wealth by means of production exploitation, commercial-trade, and all the five basic means noted above. It imposed political structures to ensure the continuation of the wealth extraction, including crown colonies, lesser colonies, protectorates, other dependency relationships, and even annexation in the case of Ireland and before that Scotland. The British organized low wage cost production of goods exported back to Britain and resold at higher prices there or re-exported. It manipulated its currency and terms of trade to ensure profit from goods imported to the colony as well. Its banks and currency became the institutions of the colony. Access to other currencies and banks was not allowed. Monopoly of credit sources allowed British banks to extract rentier profits from in-country investment lending and trade credits. They obtained direct ownership of the prime agricultural and mining lands of the colony. They preferred and promoted highly intensive and low cost labor production. Production and trade was structured to allow only those goods that allowed Britain investors the greatest profits, and prohibited production and trade that might compete with Britain’s home production. But the colonial system was inefficient, in the sense that was costly to administer. The cost of administration was imposed on the local country in part, but also on the British taxpayer. Twentieth century US Imperialism proved a more efficient system. It avoided direct, and even indirect, political control. State legislatures, governments, and bureaucracies were locally elected or selected by local elites. There were few direct costs of administration. The local elites were given a bigger share of the exploitation pie, as joint production and investment partnerships in production and trade were established with local capitalists as ‘passive’ minority partners who enjoyed the economic returns without the management role. Only when their populace rebelled did the US provide military assistance, covertly or overtly, either from afar or from within as the US set up hundreds of military bases globally throughout its sphere of economic interests. The US and local militaries were tightly integrated, as the US trained local officer ranks, and even local police. Security intelligence was provided by the US at no cost. The offspring of the local elites were allowed to enter private US higher education establishments and thereby favorably socialized toward US interests and cooperation. Foreign aid from the US ended up in the hands of local elites as a form of windfall payment for cooperation. US sales and provision of military hardware to the local elites provided built-in ‘kickback’ payment schemes to the leading politicians and senior military ranks of the local elites. Local military forces became mere appendages of the US military, willing to engage in coups d’etat when necessary to tame local elites that might stray from the economic arrangements favoring more local economic independence beyond that permitted by US interests. US multinational corporations were the primary institution of economic dominance. They provided critical tax revenues to the local government, employment to a share of the local workforce, and financial credits from US globally banking interests. The US also controlled the dominated states’ economies through a series of new international institutions established in the post-1945 period. These included the International Monetary Fund, established to address local management of currency and export-import flows when they became unbalanced; the World Bank, which provided funding for infrastructure project development; and the World Trade Organization and free trade agreements—bilateral or regional—which enabled selective access to US markets in exchange for unrestricted US corporate foreign direct investment into dominated state economies, financed by US financial interests. These investment and trade arrangements were tied together by the primacy of the US currency, the dollar, as the only acceptable trade currency in financial and goods exchanges between the US and the local economy. This new ‘form’ of economic imperialism—a system of political dominance sometimes referred to as ‘neo-colonialism—was a far more efficient and profitable (for US capitalists and local capitalist elites as well) system of exploitation and wealth extraction than the 19th century British system of more direct imperial and colonial rule. And within it were the seeds of yet a new form of imperialism based on financial exploitation. As the US economy evolved toward a more financialized system after 1980, the system of imperial dominance associated with it began to evolve as well. Imperialism began to rely increasingly on forms of financial exploitation, while not completely abandoning the more traditional production and commerce forms of wealth extraction. The question is: What are the new forms of imperialist financial exploitation developed in recent decades? Are new ways of extracting wealth on a national scale emerging in the 21st century? Are the new forms sufficiently widespread, and have they become sufficiently dominant as the primary method of exploitation and wealth extraction, to enable the argument that a new form of financial imperialism has been emerging? If so, what are the methods of finance-based wealth extraction, and the associated political structures enabling it? If what is occurring is not colonialization in the sense of a ‘crown colony’ or even dependent ‘neo-colony’, and if not a political protectorate or outright annexation, what is it, then? These queries raise the point directly relevant to our current analysis: to what extent does Greece and its continuing debt crises represent a case example of a new financial imperialism emerging? There are five basic ways financial imperialism exploits an economy—i.e. functions to extract wealth from the exploited economy—in this case Greece. The first example represents financial exploitation related to financing of private production and trade. It is associated with traditional enterprise-to-enterprise, private sector economic relations where interest is charged on credit extended for production or trade. This occurs under general economic conditions, however, unrelated to debt crises. The remaining four ways represent financial exploitation enable by State to State economic relations and unrelated to financing private production or trading of goods. One such form of financial exploitation involves state-to-state institutions, public sector economic relations where interest is charged on government (sovereign) debt and compounded as additional debt is added to make payments on initial debt. Another involves financial exploitation via the privatization and sale of public assets—i.e. ports, utilities, public transport systems, etc.—of the dominated State, often at firesale’ or below market prices. Privatization is mandated as part of austerity measures dictated by the imperialist state.as a precondition for refinancing government debt. This too involves State to State economic relations. Yet a third example of financial exploitation also involving States occurs with private sector investor speculation on sovereign (Greek government) bonds that experience price volatility during debt crises. State involvement involvement occurs in the form of government bonds as the vehicle of financial speculation. Even more indirect case, but nonetheless still involving State-State relations indirectly, is private investor speculation in private financial asset markets like stocks, futures and options on commodities, derivatives based on sovereign bonds, and so on, associated with the dominated State. This still involves State to State relations, in that the investor speculation is a consequence of the economic instability caused by the State-State debt negotiations. Finance capitalists ‘capitalize’ on the debt crises that create price volatility of financial securities, making speculative bets on the financial securities’ volatility (and in the process contributing to that volatility) in order to reap a financial gain from changes in financial asset prices. And they do this not just with sovereign bonds, but with stocks, futures options, commodities, and other financial securities. All the examples—i.e. interest on government debt, returns from firesale prices of public assets, investor speculative gains on sovereign bonds, as well as from financial securities’ price volatility caused by the crisis—represent pure financial wealth extraction. That is, financial exploitation separate from wealth extraction from financing private production. All represents ‘money made from money’, in contrast to money made from financing the production or trading of real assets. During the pre-2008 boom cycle years, credit flowed to Greece and the periphery to enable the purchase of core exports of goods. When the core stopped the flow of credit after 2008, what was left was debt. But interest on debt was as lucrative to the core banker interests as was purchase of export goods. Repayment of loans and other credit extended by the Troika to Greece’s government and central bank were recycled back to Eurozone core private interests—95% of same, to be exact. Without true economic recovery after 2009 for the periphery, each time more debt had to be extended in order to repay old debt, and interest payments were added to interest payments and compounded. Financial imperialism increasingly assumed the form of state-to-state debt and interest flows, accruing eventually in the northern core banks and financial institutions. New means for financial exploitation were spun off and added in the process—financial gains from privatization and financial gains from government bonds and financial securities speculation. Greece was sucked into the debt machine where the fix itself became the cause of ongoing and ever worsening entanglement, with no release in sight. For Eurozone bankers, it was just too good a ‘deal’ to terminate: perpetual debt interest money flows back to them, guaranteed by credit extended by the Troika institutions. Overlay on top of that, cycles of opportunity for financial speculation on bonds, stocks, derivatives, and other financial securities. It was even better than Greeks buying German and northern core exports of real goods to Greece. Exports might decline with economic conditions and competition. But debt repayments were guaranteed to continue—for as long as Greece remained in the Euro system at least. Financial imperialism may just prove more profitable than older forms of imperialism based on production and commerce of goods. This shift to financial exploitation and therefore financial imperialism is a harbinger of things to come for smaller economies and states that allow themselves to be integrated into 21st century capitalism’s drive to concentrate and integrate economies into broader customs (goods trade) unions, currency unions, and banking unions in which the larger, more economically powerful states and economies will naturally dominate and exploit financially their weaker members. A new form of integrated financial imperialism is thus in the making. Greece is likely to be but the forerunner.